Last week, on FB, my friend Elizabeth asked everyone to share their favorite hymns. I have a lot of favorites. Probably 10-15. I like robust hymns! I like hymns with great back ground stories. I like hymns with deep and high thoughts of God. I like hymns chock full of doctrine. I have shared a few of my favorites here on the blog. For a list, check out the "favorites aka archives" page and scroll down to Hymns and Haws. Well, way back a LONG time ago, Mr. Hippie decided to teach the boys a new hymn every few weeks. And he didn't pick little Sunday School ditties either. And that is when I first heard this hymn that has become one of my favorites. 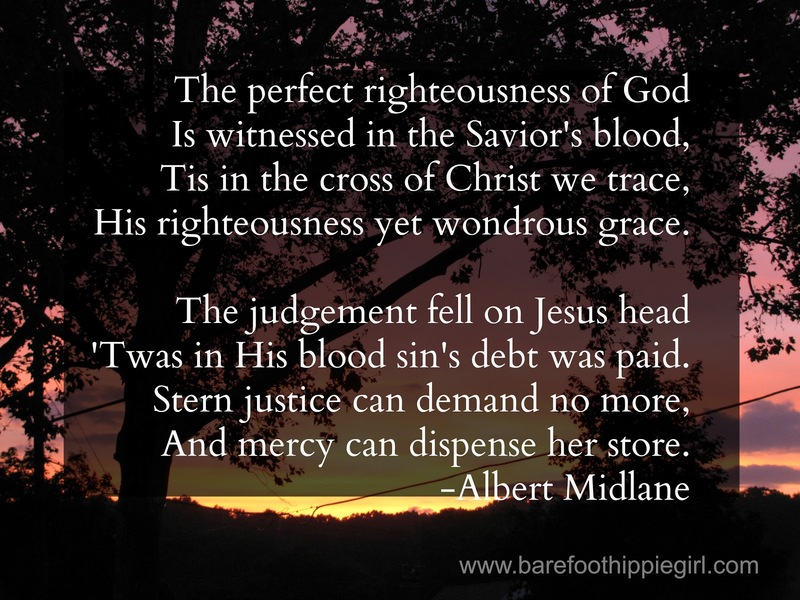 The Perfect Righteousness of God was penned by Albert Midlane, sometime in the mid to late 1800s. Mr. Midlane was born, lived and died on the Isle of Wight. He wrote over 300 hymns and 1100 poems, the first of which was published when he was 17 years old. He was most known for a popular children's hymn that he wrote in 1859, There's a Friend for Little Children. It was translated into many languages around the globe. I love The Perfect Righteousness of God because of the deep theology it embodies. It tackles the thoughts of justice being served and mercy being extended. It shows how this mercy is based on Jesus Christ's innocent blood being shed on the cross, thus meeting God's standard of righteousness. It demonstrates that there can be no peace without the (sin) problem being dealt with. Through the cross, all the facets of God's character were shown and were satisfied. His wrath and love. His anger and judgment. His righteousness and atonement. His justice and mercy. His holiness and sacrifice. His grace and peace. And that is a profound thought! What's your favorite hymn or Christian song? Why? Leave me a comment.